When it comes to toddlers, most parents recognize it as the critical age. And when it comes to educational games for their toddlers, it's no different. The problem is that the recognition of its importance often leads the parents in a faulty search that doesn't necessarily serve their toddlers in the long run. What educational games are the best for your toddlers? To answer that question, I must first tell you how I define "educational games". What is an "educational game"? I think the "game" part is very obvious. It's anything that is entertaining, and involving where it occupies the toddler and engages her. The "educational" part is a little tougher. If you read our page on intelligence, you would know that the term originates from the meaning "to bring out". The first point is easy enough to understand. It's based on the definition from the intelligence page. But I bet the third point raised some eye brows. For years we've been told that we grow brain cells in our infancy and then we start to lose them throughout our lives and that they never grow back. As it turns out, this just simply isn't true. So what's going on here? New brain cells? Some of the following summary points are based on the book "SPARK: The Revolutionary New Science of Exercise and the Brain" by John J. Ratey, MD. It's no secret that humans have larger and more developed brain than the other creatures. That's why we are able to perform higher functions. So it goes without saying that having more brain cells, healthier ones at that, can't hurt either. Then the question is, how do we grow new brain cells and make the existingcells healthier (or "bushier" if you'd like)? The answer is deceptively simple. Promise that you won't scoff at it or dismiss it without reading it through. No, it's not doing more puzzles, or eating more greens, though they aredefinitely good for you. Yes, exercise. Specifically, aerobic exercise, anything that gets your heart rate up. In a nutshell, this theory is based on the theory of evolution and backed up by modern science. The theory goes that in order for the early humans to survive - that is, find food - they had to move. They had to move their bodies constantly and when sources of food was found, their brain would need to work to remember where the food was or how they got the food. So movement is very closely integrated with learning. Aside from making new and stronger neuron connections, modern science has also discovered that movement (e.g., aerobic) releases hormones in the body that stimulate growth of new and healthier brain cells. As a high school in Detroit learned, having kids participate regularly in aerobic exercise increased their learning abilities along with a host of other positive side effects (e.g., improved self-confidence, self-esteem, easier socialization, improved fitness, reduction or elimination of anxiety or depression, etc...). 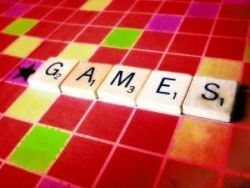 So it would seem that when we think about educational games for toddlers or kids of any age, we shouldn't limit the options to mere computer games, board games, or other games played sitting down. Why not go outside and throw the ball around for a little while? Or let the kids run around kicking the ball, or play tag? It's not all just fun and games. It's educational too. The above summary of the connection between exercise and brain is from a book called "SPARK: The Revolutionary New Science of Exercise and the Brain" by John J. Ratey, MD. Although efforts have been made to accurately summarize a few points from the book, I cannot guarantee in any way the claims of the author. Having said that, I would strongly recommend anyone interested in the topic to pick up a copy of the book and read it for himself/herself.